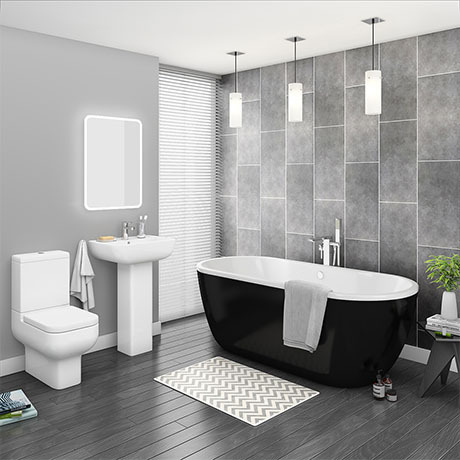 The seriously stylish modern Pro 600 bathroom suite, features contemporary elegant styling with a on-trend modern black free standing bath tub. The close coupled toilet only projects from the wall by 600mm. Supplied with a wrap over soft close seat which stops the lid from slamming and a dual flush with polished chrome flush button. The quality 550mm wide 1 tap hole basin has a overflow and comes with a full pedestal. The stylish contemporary black and white free standing double ended bath tub is great for adding 'wow factor' to new bathrooms, manufactured from 4-6mm thick double sided acrylic - ensuring a long life and improved heat retention properties.